Salad spinners are a waste of time. Why bother? I used to think that, too, and I’ve long been a fan of collecting wet salad leaves up in a tea towel and spinning them round like a banshee, stood outside the back door. The neighbour’s loved that. 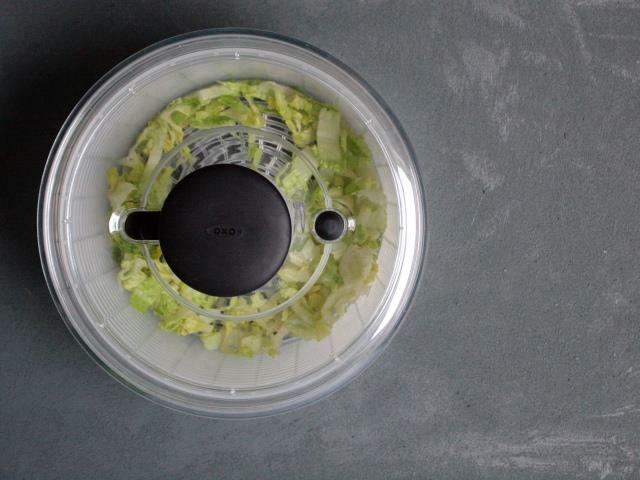 A salad spinner is a much more civilised way of drying wet lettuce properly. Alright, but why this one? My previous experience of a salad spinner was a bit of a let down, mainly because it came from IKEA. This one is different, though, in a couple of ways. It’s pretty well made, but more importantly, it isn’t a one-trick pony. The basket doubles up as a handy and quite capacious colander, as well as serving as the internal spinny thing that actually does the work. So far, so good. More? This is from OXO, a company known for challenging the norms of design. Their philosophy is one of ‘universal design’, to design products that can be used by as many people as possible, and to find and drive out inefficiencies in accepted or established designs. This all means that OXO products have little design edges – bigger handles of softer, grippier rubber, so that everybody – young, old, able or disabled – can get a proper hold of whatever it is, products that work equally well for right and left handed people, design twists that tackle life’s annoyances and make them go away. Good design changes lives, because it helps people to do things more easily than they could before. What’s the twist with this salad spinner, then? The fiddly little handle that you have to turn in small, tight circles, the one that pulls your wrist into all sorts of contortions is gone, replaced with a big, rubberised plunger. To work it, you simply pop out the plunger and press it down a few times. You can work it with an elbow, it’s that easy. A rubber ring on the base provides a ton of grip, and the result is that you can dry a load of wet lettuce with one hand, from start to finish. Think about that for a second. It’s such a simple task for me, but I’m fully able-bodied. If you’ve got arthritis, or MS, or you’ve lost or have reduced use of an arm or hand, or if you’re young and your hands are a bit smaller, you’re going to struggle – this helps overcome that struggle, just a little bit. That’s a brilliant thing, and it’s what good design should be all about.